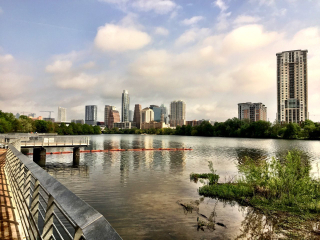 Here's a checklist of things to do in Austin this Spring! The lineup gets more impressive each year. This year is no different and features renowned local and national chefs. This event for car enthusiasts is one of the best the city offers. The show started over ten years ago as a small gathering on a football field, and has grown into a huge event with cars from all over the country. Some have even gone as far as to call it the best car show in America! Throughout Spring & Summer Austin Parks partners with organizations to host FREE movies in the park! See website for a full schedule. Free yoga classes are held every Wednesday from noon to 1 p.m. in April, May, and September. The Moontower Comedy and Oddity Festival brings together some of the country's most renowned comedians and a ton of local talent for days of non-stop laughs. The comedians do everything from stand-up and sketch to improv. The UMLAUF Garden Party is a chance to spend an evening at the Sculpture Gardens in a one of a kind setting. They’ll have wine, bites from the city’s most iconic restaurants, and both live and silent auctions. Austin is a city that loves its beer. Forthe first time ever, the Untapped Indie Music and Beer Festival is coming toAustin. They’ll have 65 breweries and 200 beers at Carson Creek Ranchfor a day of boozing and listening to music. I think this festival is going tofit right into the Austin scene. The longest running free concert series in Austin is back for its 22nd Season! They have $3.50 Ziegenbock drafts, good food and great music! It's always fun and a great way to spend Thursday evenings throughout the summer. This event is an Austin staple! Austin’s favorite soul band is releasing its debut vinyl, “Good As Gold,” and they’re having a party to celebrate! This is exactly what the title suggests, wiener dog racing. It’s entertaining and the money goes to a good cause. Keeping Austin Weird doesn't fully describe this festival. The crowd is, well, eccentric. Picture hundreds of people in costume, dancing, sitting in drum circles, and running around Maypoles to celebrate the birthday of a fictional donkey. It’sthe season for one of Austin’s oldest and longest running festivals. If you’ve never been, it’s a gigantic street fair with music, art, kids activities, jewelry, giant turkey legs and all kinds of other cool stuff. It’s actually the largest art festival in Central Texas, attracting over 300,000 people! The Texas Olive Festival focuses on way more than just olives! They have cooking classes and demos, food and wine tastings from local restaurants, orchard tours, activities for the entire family, movie nights, live music and more fun! Nothing says spring like spending some time at the ballpark. Celebrities, musicians and professional athletes play nine innings and after the game fans are invited out on the field for a family friendly concert. We just had the annual adult spelling bee, and now it’s time for the O.Henry Pun-Off. This hilariously creative event has become an Austin staple, and it never disappoints. Leave it to Austin to turn “the most exciting 2 minutes in sports” into a music festival. Derby In The City will air the Kentucky Derby on their jumbotron while artists play throughout the day. Come dressed in your Derby best. Each spring, the Austin Metamorphosis Dance Ensemble does BalletUnder The Stars and it’s a favorite every year! It’s not that often you get to watch ballet under the moonlight,so get out there and enjoy what is a pretty unique opportunity. Music in the Park is a FREE event in Mueller's Lake Park Amphitheater. Rich Restaino and the Obits will be performing from 6-8pm. Bring a blanket and picnic and enjoy the music. This is the closest you’ll be able to get to Longhorn Football this Spring. If you love everything cajun, this is the event for you. It features eight Louisiana bands, and some amazing food vendors who selling everything from Jambalaya to Alligator. Do you like crawfish? The Louisiana Swamp Thing & Crawfish Festival has 7,000 pounds of boiled Live Crawfish! In 2015, Austin’s iconic art fair prepares for its 65th year! With an annual attendance of 20,000, this juried art fair is the biggest and best art marketplace in central Texas. Sip and swirl with live music, artisans and lavender fields in bloom. There will be lavender products, plants, vendors, cooking demos, guest speakers, culinary delights, concessions, wine tasting & tours, vintner luncheons, music and much more. The biggest Texas Country concert in the Austin, TX area each year. The 2015 Jam will be held at The LBJ Library Lawn on campus at The University of Texas at Austin on Saturday, May 2nd and Sunday, May 3rd. $1 Austin Beerworks Cans, a Ping-Pong tournament, and general "taking it easy" will ensue. Windmill Bicycles will have a pop-up shop and there will also be screen-printing by Fine Southern Gentleman. One person in attendance will win a Fairdale bike! Mack Brown, Jack Ingram and Matthew McConaughey joined forces a few years ago all in the name of charity.